Collard greens are one of my favorite southern, soul food dishes. It makes an appearance at Sunday family dinners and just about every single holiday. Normally my grandmother, who is known for her outstanding southern cooking that made a preacher cuss (but that's another story), makes the collard greens because everyone else is too scared to make them. For Thanksgiving this year we decided to give her a break from cooking and let each family bring a dish. Guess which dish I was in charge of? Yep, collard greens! I was excited about preparing them. I always knew I made a mean pot of collard greens but nobody in my family had ever tasted them. I proudly brought my pot of collard greens and placed them on the Thanksgiving food table. They were gone in a matter of minutes! 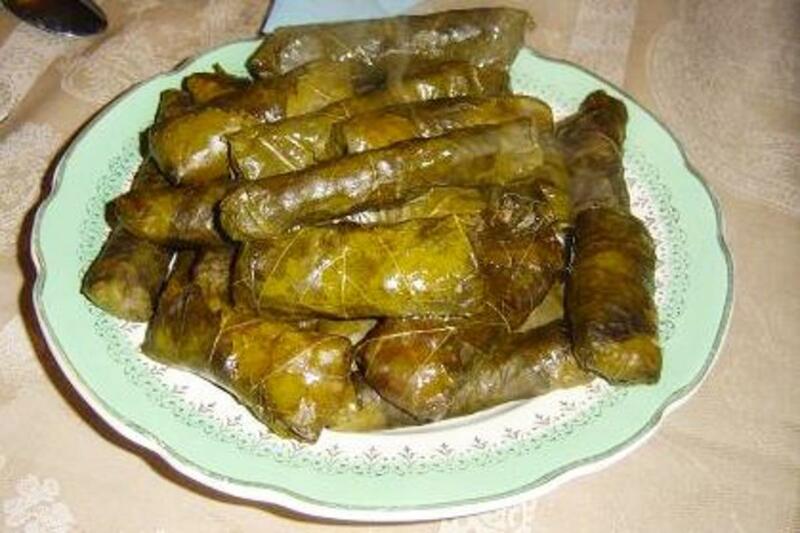 Everybody raved about how flavorful they were and nobody believed I made them. Even the kids were going back for more. I think I gave out this recipe over 10 times that day. I felt so honored, but nothing made me feel more honored than what happened a week later. My grandmother called me on the phone and the first thing she said was "Tell me how you make those collard greens" I nearly hit the floor. The queen, no GOD, of southern, soul food cooking was asking little ol me for my recipe?! PRICELESS!! I can now die a happy, accomplished cook. I bet you can't eat just one bowl! Remove the collard green leaf from the steams. Discard the stems. 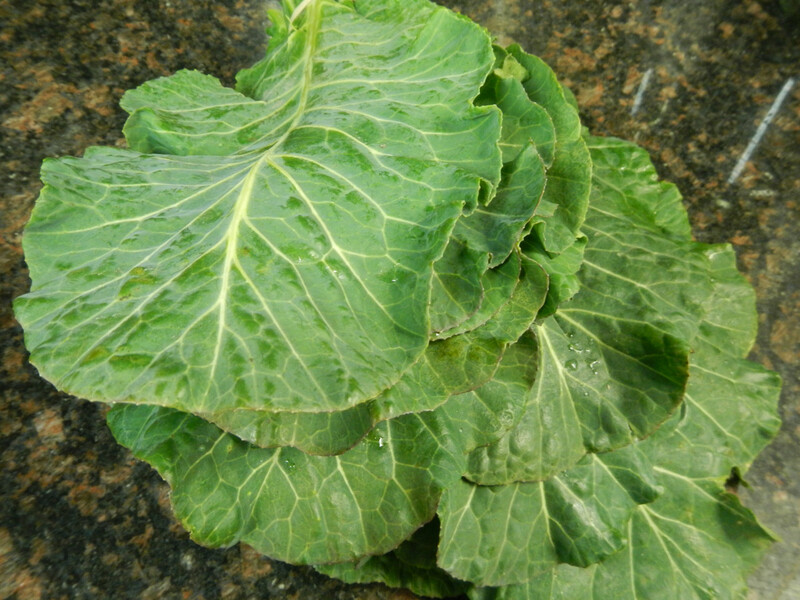 Wash the collard greens several times in cold, salted water to remove the dirt and grit. Tear collard greens into bite size pieces. Set aside. In a large pot, heat a Tablespoon of olive oil. Add in the chopped onions & garlic and sauté until tender. Pour in the chicken broth, red pepper flakes and smoked turkey leg. 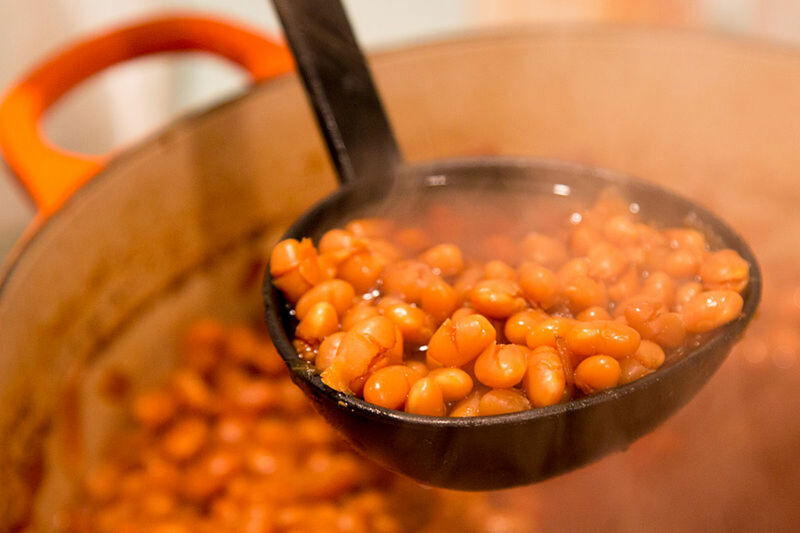 Bring to a boil and then reduce heat and let simmer for about 10-20 minutes. Add in the collard greens. Cook on med-low heat for about 45-60 minutes or until tender. Do not boil the collard greens, let them steam cook. When done, season with pepper and hot sauce if desired. Serve the meat right alongside the collard greens and don't forget that you can drink the juice! Use chicken broth instead of water. Using chicken broth really kicks up the flavor of these smokey greens and makes the juices downright addictive! Let the meat cook in the broth before adding the greens. This allows the broth to become infused with the meat, onions, garlic and red pepper which will then infuse into the greens. Don't boil the greens no matter what you've heard. Cooking the greens on low and steaming them allows them to keep that gorgeous green color, preserves more nutrients and produces a tender leaf. Boiling can cause overcooking. Nobody wants to eat mushy greens. Although this recipe really doesn't need it, If you desire to season the greens with pepper, hot sauce or vinegar do so after it is done cooking and in individual bowls. Have you ever made collard greens? 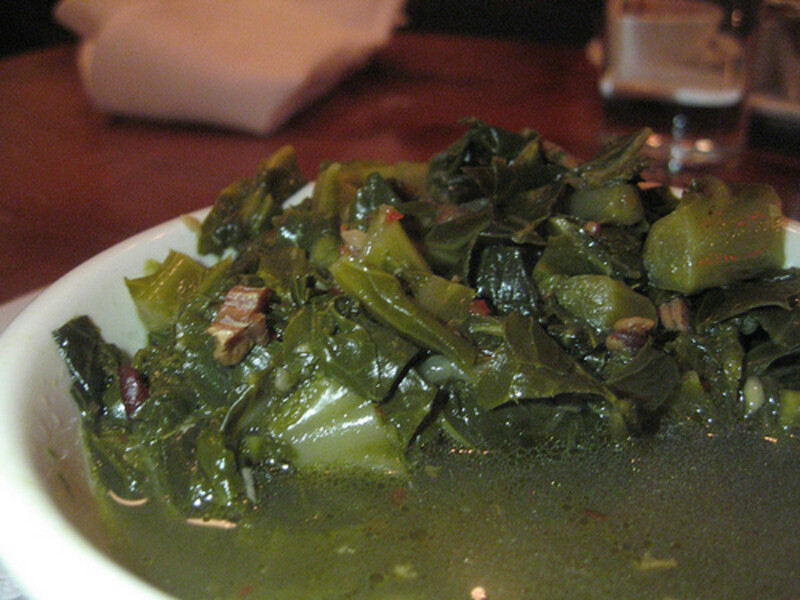 For centuries collard greens have been used and cooked. 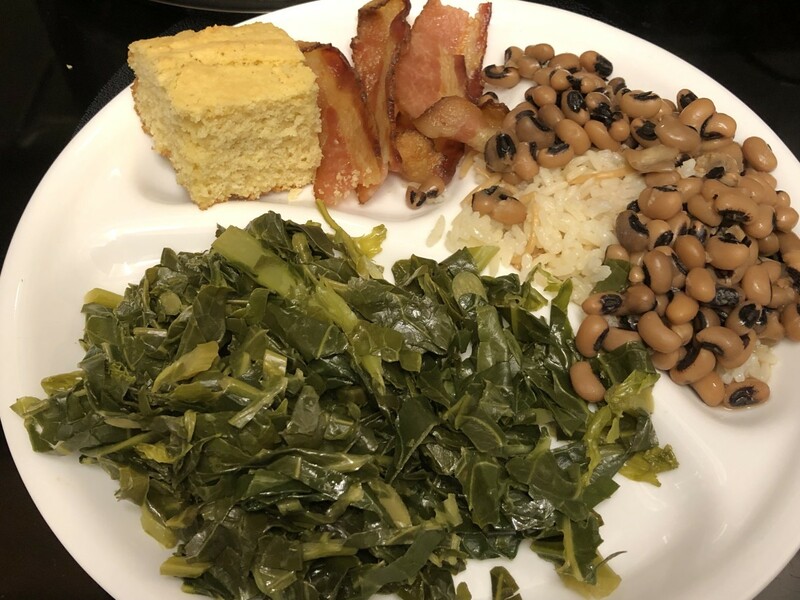 The southern way of preparing these collard greens was created by the African slaves who were brought to the southern colonies. 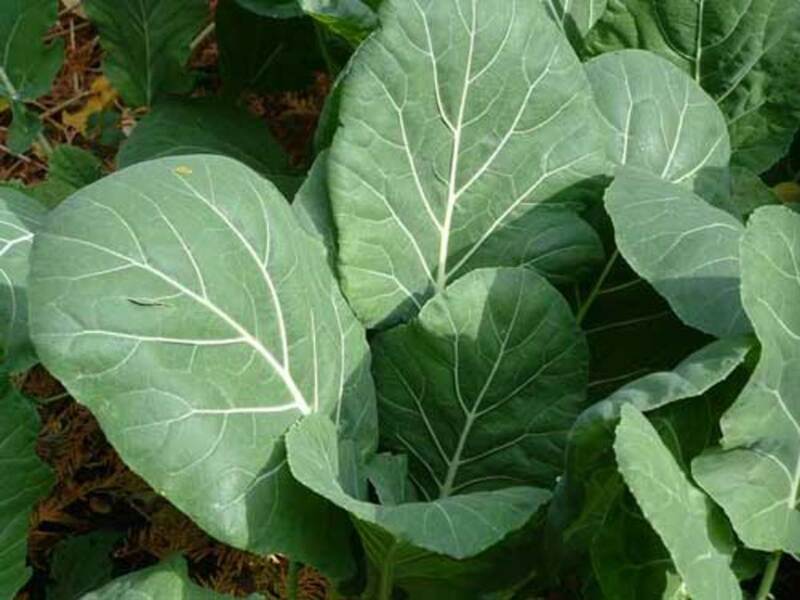 Collard greens were not generally seen as "food" but the slaves needed a cheap way to satisfy their hunger and provide food for their families. 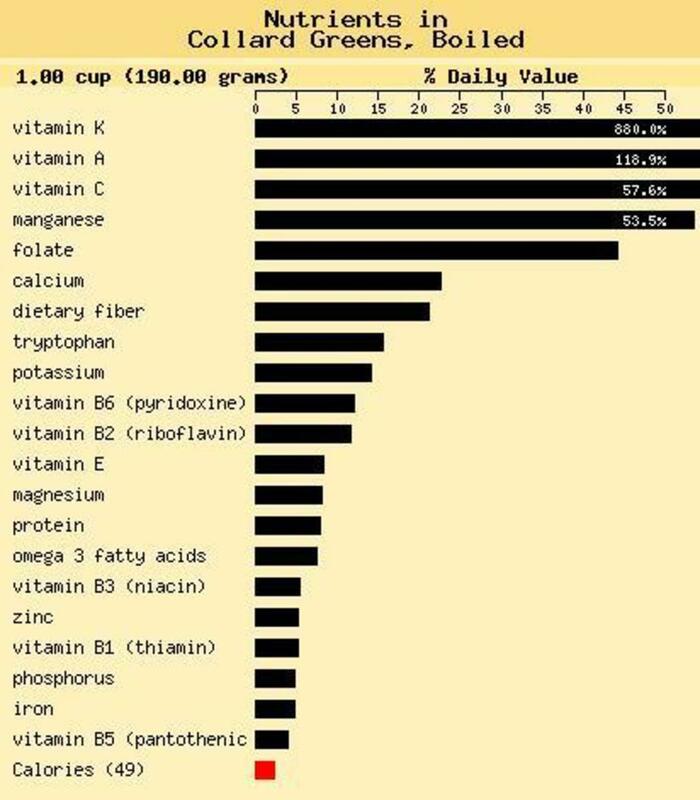 Greens did not originally come from Africa, but the method of eating greens that were cooked down into a low gravy, and drinking the juices from the greens (known as pot likker") has it's African roots. During these times, slaves where given the scraps from the plantation kitchen which consisted of turnip tops, pigs feet & fat, vegetable peels and various other "inedible" items. 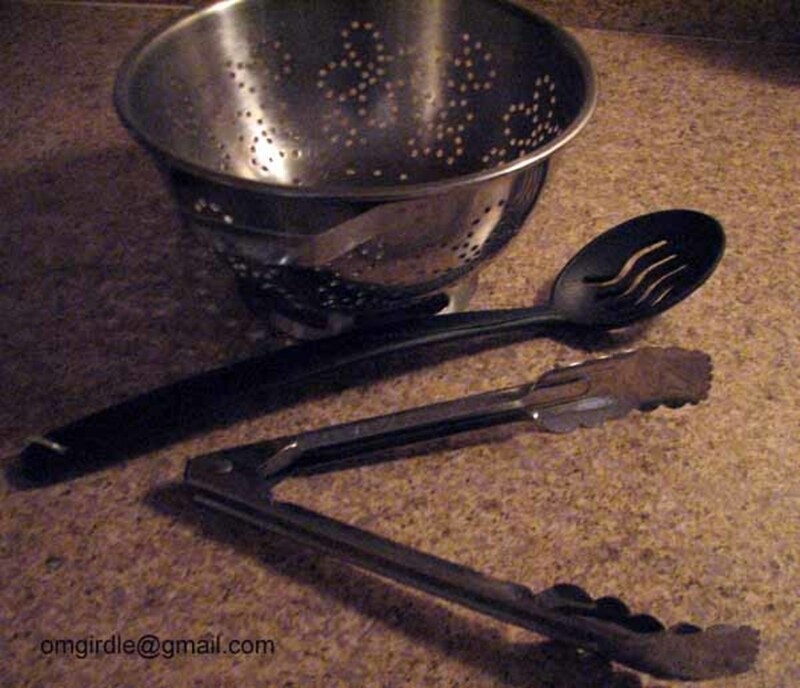 They were forced to create meals from these leftover scraps and one of these creations were southern collard greens. 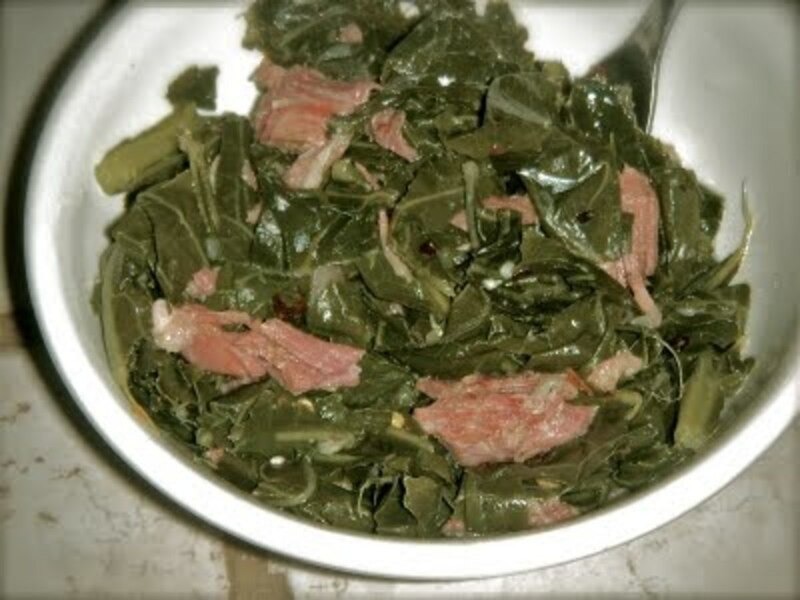 Collard greens that were boiled low and slow with spices and a chunk of meat to give flavor. This recipe sounds amazing and I can't wait to try it. I have been wanting to learn how to make this for the longest. I never had collard greens til about 6 years ago and I loved it. I have always loved soul food but never tried the collard greens. I am Puerto Rican and we eat all kinds of food and I make delicious Puerto Rican dishes. I know how to make mac & cheese and fried chicken really good but now because of your article I can make the collard greens. Thank you and enjoy your day. Thank you! Soul food's history is deliberately omitted from American history in order to continue perpetuating stereotypes about black people: we don't eat right, don't eat vegetables, soul food is exclusively fattening and unhealthy as supposed to what southern food? The stereotypes go on despite the fact that the American diet has been for decades full of salt, sugar, and grease but soul food is bad for you. White people and the media deride us for eating fatbacks and such but the fact that we as slaves were given scraps to feed our families is a small part of a national disgrace kept quiet. Now, collard greens and kale are considered leafy green vegetables (as if they only recently became that) fit for gourmet cooking. 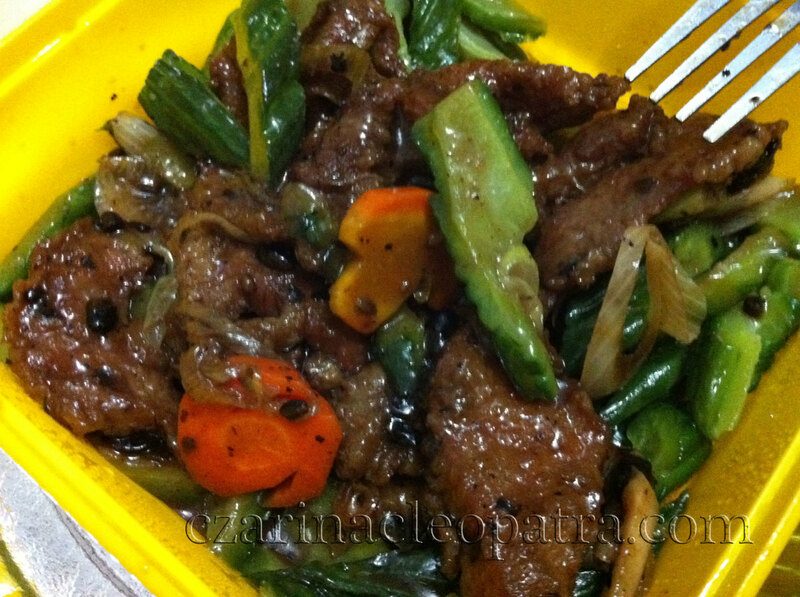 A gourmet dinner staple made popular for whites to eat by Gordon Ramsay and popular media. Because it's gourmet now it's expensive. Years ago it was "poor black people's food". I enjoyed your hub about collard greens. What a tribute to your talent as a masterful chef. I am definitely going to try your recipe and sharing with others. Thanks! Love your video. Just a note though. You said that 'Greens did not originally come from Africa'. Well, it is true that the slaves could not have brought the greens with them, but the fact remains that greens and starchy foods was a staple for the slaves back when they were in Africa, way before they were taken as slaves. Thus the, way of cooking, which was carried over, like you said, 'down into a low gravy, and drinking the juices from the greens' , was just a reflection of what they knew. The only difference was the type of green being used. Love how your son kept popping up here in the video. Interesting hub. Thanks for sharing. Voted Up and Useful! Pretty kool.. Yet sad it was that way... But makes for a good recipe. This recipe is awesome!!! I live in Houston, Texas and grew up on soul food but never cooked it. Your video and step by step recipe is so on it. We just finished dinner and I received rave reviews. Thanks for teaching me how to cook Collard Greens to perfection. WOW!!!!!!! This is the first and last recipe I have tried. I have never had collards and it is AMAZING when you make this recipe!!!!! I absolutely love this recipe and I can't wait to make this again!!!! Thank you!!!! Like my kids say... O.M.G.!!! I've made collards all my life and they have NEVER tasted as good as this recipe. Thank you for sharing. This is definitely a keeper!! Took them to work for a luncheon, everyone wanted "my" recipe!!! 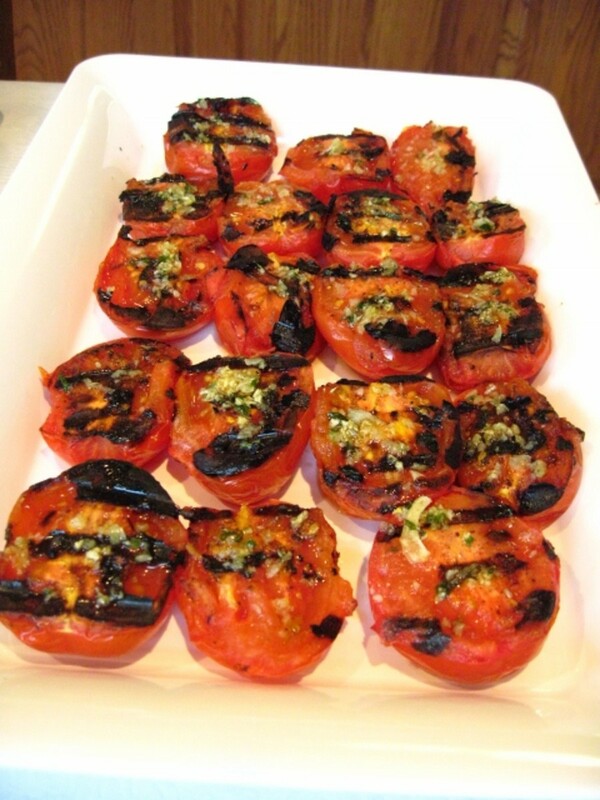 I just finished making this recipe....WOW! I couldn't stop eating them! This is absolutely the best greens recipe I have ever tasted! I deleted all the other greens recipes I have saved, won't ever use those again. Thank you so much for sharing your recipe and your tips to perfect greens! What a wonderful story! I would have been so honored to have been asked for a recipe from my grandmother!